House musician Jonathan Coulton leads a parody game on Ask Me Another at the Bell House in Brooklyn, New York. Liver lovers, rejoice! In this music parody game, songs with the word "heart" in the title are rewritten to make them about other bodily organs. Heard on Michael Ian Black Is Back, All Right! 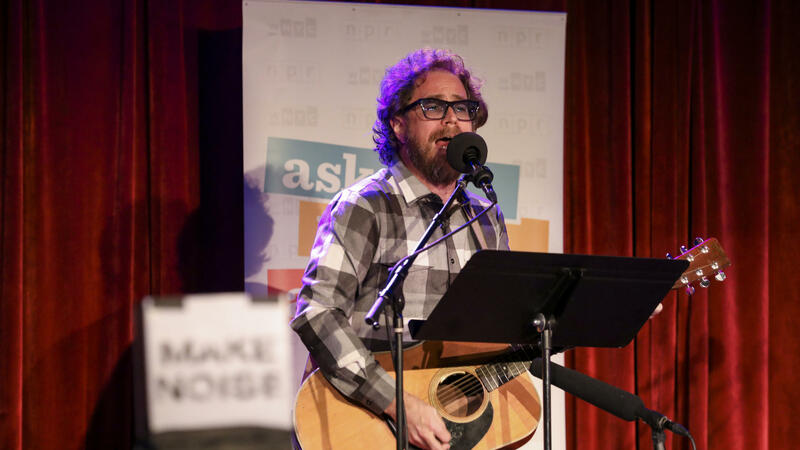 JONATHAN COULTON: This is NPR's ASK ME ANOTHER. I'm Jonathan Coulton. Now here's your host, Ophira Eisenberg. Thank you, Jonathan. Before the break, we met our contestants Rebecca and Christopher. Rebecca, do you have a Valentine's Day tradition of any kind? REBECCA FERRER: I do. My husband and I met when he were - we were both in college. And our first Valentine's Day was - I had graduated, and he was doing a victory lap. And we ordered in - Italian takeout - but we didn't really have any place to sit because he lived in a frat house. So we sat on the floor of his bedroom at the frat house, and that has now been our tradition. We order from the same Italian place, and we eat on the floor. EISENBERG: Of a different frat house every year. EISENBERG: Christopher, how about you? Do you have a Valentine's Day tradition? CHRISTOPHER DOWNS: Only one married Valentine's Day so far - it's just been real smug - just ring real smug and relax that it no longer stresses me out. I had 36 awfully stressful Valentine's Days, and now they're all just chill. EISENBERG: I like it. Let's go to your next game. This is a music parody called Change Of Heart. Many musicians have written about the heart giving other bodily organs short shrift. That ends today. COULTON: We rewrote songs with the word heart in the title to make them about other bodily organs. Ring in to identify the organ I'm singing about. And if you get that right, for a bonus point, you can identify the original song or the artist who made it famous. EISENBERG: OK. Christopher, stay in the lead, and you are in the final round. Rebecca, you need to get more points, or you have to tell us which television show is better - "The Resident" or "New Amsterdam." COULTON: All right. Here we go. (Singing) The back of the abdomen is your place. You two bean-shaped things come in a pair just in case. Passing a stone and it's killing me, but it makes me think of you every time I pee. COULTON: For a bonus point, can you name the song or the artist? FERRER: So sorry - that's a no. COULTON: OK. That's all right. That was "Hungry Heart" by Bruce Springsteen. COULTON: (Singing) Enzymes breaking down the food that I chew, peristalsis going to smoosh it all through - esophagus, esophagus, the esophagus leads here - you. COULTON: Stomach is the answer. That's right. COULTON: Bonus point if you can name the song or the artist. DOWNS: "Stop Dragging My Heart Around." COULTON: Yeah, that's right - Stevie Nicks, Tom Petty. COULTON: (Singing) Detox my bod. The portal vein brings you blood. Break down my fat and also the gin that I drank. Woops, I drank too much gin. Metabolize. I need your bitter bile. Detox my bod. COULTON: The liver - that's right. DOWNS: Toni Braxton, "Unbreak My Heart." COULTON: Bonus point goes to you. OK. Here's your next one. (Singing) Air is drawn in through your bronchial tubes as you expand. CO2 goes out, O2 comes in to me, to man. Hey, wait. I got a little bit faint. Oh, yeah. Well, I was singing. I forgot to breathe. COULTON: Lungs - that's right. Bonus point - can you name the song? COULTON: Yeah, that's right - Nirvana. EISENBERG: Now, a lung-shaped box is not as romantic, but it can hold more. COULTON: This is your last clue. (Singing) Once upon a time, I was living in you. Now you're all I'm thinking about. There's nothing I could do. Your contractions were forcing me out. FERRER: It's cervix or uterus. Your contractions reverse me out, right? Uterus. COULTON: Uterus is correct. That's right. COULTON: Bonus point if you can name the song. FERRER: It's "Total Eclipse Of The Heart." COULTON: It sure is - Bonnie Tyler. EISENBERG: Guys, you're both fantastic. After two games, Christopher is moving on to the final round.